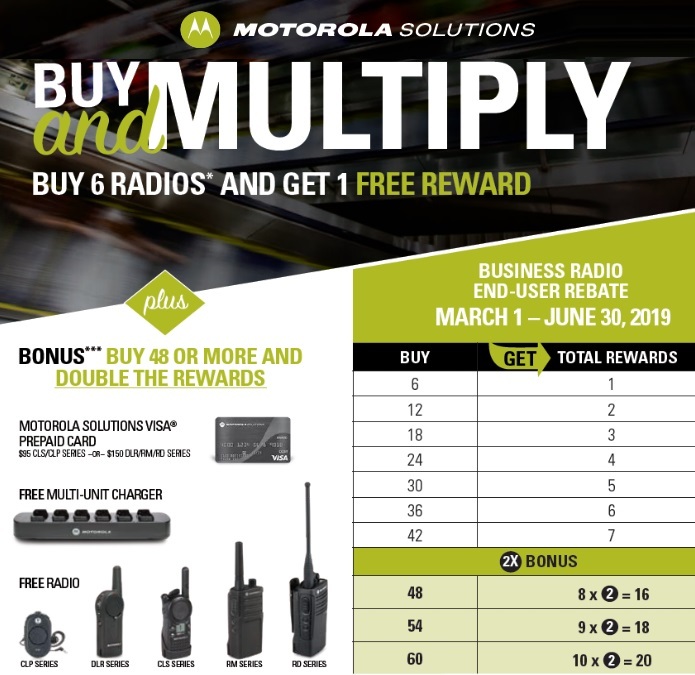 *Now through June 30, 2019, receive one of the following FREE rewards with each qualified claim of six (6) same series radios (up to 60): 1) a Visa prepaid card, or 2) a radio, or 3) a multi-unit charger. End-User may also qualify to receive a reward BONUS. The BONUS is activated when total qualifying purchases from approved claims reach forty-eight (48) or more radios. Once activated, the end-user will get one extra reward per claim of six (6) same-series radios for all approved claims (up to the maximum qualifying limit). Click here to see the details. There are currently no deals from the manufacturer for Kenwood products. There are currently no deals from the manufacturer for Blackbox products. There are currently no deals from the manufacturer for Icom products. We are currently giving away a free Cat 10K mAh PowerBank with every Cat S60 phone purchase, a $65 dollar value. Please see the Cat S60 phone page here for more details.